Two Fridays ago (February 16 2018), Disney Channel premiered it's newest original movie, Zombies. If you have been following me on this blog, you know that I am a 25 year old adult woman. However, I love Disney Channel musicals so I had to check this one out. When I first heard of the title, "Zombies," I was convinced this was some kids Halloween movie (like Halloweentown). I did ask myself: Why are they showing a Halloween movie in February? I definitly think they should have spent more time thinking of a better name for this movie than "Zombies." Maybe "Zombies, The Musical"? When you think of a Zombie movie, you don't think of kind, benevolent, cured Zombies that fill up most of this movie. 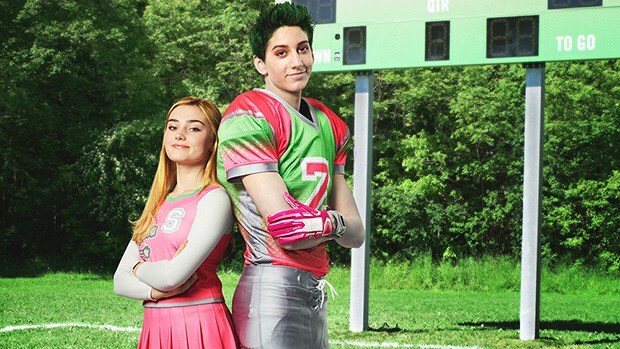 I was reading the credits for this movie and I saw that it was based on something called, "Zombies and Cheerleaders," which I would have to agree is a better name. But once I found out Zombies was a musical, I decided I was definitely going to check it out. I enjoyed this movie. What can I say? I'm a sucker for two cute High School kids falling in love and singing duets. I've been listening to the song, "Someday," on repeat - both the ballad and regular version. Their love is so cute. In the song, I love how they acknowledge that they are different and how it attracts them to each other. I also like how they are being silly in the face of adversity. "I'm rooting for us," they sing. The use of lighting and props to be silly and show admiration towards each other is super cool. Zed *putting a napkin on*: "Girl, you look delicious. Oh, I mean gorgeous." Addison: "Well, now you're getting fearless." I love the playful teasing and witty banter. Also, when he says that he wants to eat her - it's a funny Zombie reference because Zombies eat human brains! One thing I've noticed about Disney Channel Original Movie Musicals is that there is always something I like to call the "kiss fake-out." This happens a lot - especially in the first movie of a musical series. The two romantic leads are about to kiss but don't. This happened in Descendants, this happened in High School Musical. Disney Channel is so pure - but I love it because it is different and it shows that our leads are attracted to each other on more than a physical level. (Teen Beach Movie never did get us a kiss even in Teen Beach Movie 2!!!). So of course, Zed and Addison don't kiss in this movie. But here's to a Zombies 2?!?!?!! In Seabrook High School, cheer-leading is a better sport than Football! I thought that was neat! Also the captain of the squad is a boy which is cool because usually media shows just girls being into cheer-leading. I like how the movie is saying that we shouldn't exclude people who are different than us. When I hear Zed and Addison sing, "Some day, we could be ordinary," I am moved because in today's society, for the most part, mixed raced couple are allowed to be who they are. However, all the symbolism to race relations did bother me because the movie is kinda implying that people of color are similar to zombies which is offensive. Zombies are dangerous monsters in folk-lore and it just seems wrong to compare them to people of color. Zombies has an entire plot line about how there is segregation of schools between humans and zombies. And of course, zombies get less funding and resources for their schools. Sound familiar? It's too similar to events that actually happened in American History. The giant wall in Zombies is so similar to today's discussion of the wall Trump wants to build between the United States and Mexico. I mean it is good that they are saying that discrimination is bad, but something made me feel off about it. Zombies is a kid's movie so I am willing to let it off the hook. Zombies isn't being super serious and trying to make a comment on society like some other movies are (like Will Smith's Bright which also uses monsters to make a point about race discrimination). Zombies is a fun musical which I enjoyed. I liked the look of the movie. It was aesthetically pleasing - the pastels of the cheerleaders, and green, grungy look of the zombies. The dancing and music were fun all around (although, you can guess which song is my favorite). I recommend it to kids, teenagers, and adults who are hopeless romantics like me.